Nairobi — An African delegation is in the Polish city of Katowice to join 30,000 delegates and thousands others from almost 200 countries attending the 4th edition of what has come to be known as annual climate change negotiation conferences organised under the auspices of the United Nations. This year's conference comes 24 years after the establishment of the U.N. Framework Convention on Climate Change, and it is the fourth since countries inked a deal in 2015 in France where after years of disagreements, adopted the Paris Agreement on climate change. The two-week conference takes place at the backdrop of the alarm sounded by scientists working under the auspices of U.N.-mandated Intergovernmental Panel on Climate Change (IPCC), whose special report released in October warned of dire consequences if the global community fails to put in place drastic measures to arrest the accumulation of climate-polluting emissions which cause global warming. In its "state of the climate" report released few days ago, the World Metrological Organisation (WMO) indicates that the 20 warmest years on record have been in the past 22 years the global average temperature, and if the trend continues, the temperatures may rise by 3 to 5 degrees Celsius by 2100. This spells doom for communities at the frontline of climate change impacts, but which may not be aware that the shifting seasons which are making it impossible for them to plant crops as they used to, the erratic rainfall which appears late and ends even before they plant, and are characterised by floods that wreck havoc in villages and cities, recurrent droughts which wipes their livestock and crops, are all manifestation of the changing climate which they should learn to live with in the foreseeable future. The negotiations taking place in Katowice are aimed at discussing the best way possible to defeat challenges posed by climate change. Over years, discussions have centred on the efforts to reduce the green house gases believed to accelerate global warming, and how to live with the damage already caused while helping those who are unable to absorb the shocks emanating from climate change impacts. At stake is the so-called "Paris Rulebook", a framework of the Paris Agreement implementation which has already resulted into fissures between delegations from developed countries and poor countries. 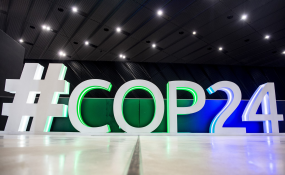 Developing countries, especially those from Africa, want the elements of the Paris rulebook to be as unambiguous as possible to avoid past deliberate oversights that have rendered impotent previous Pacts aimed at addressing climate change. On their part, industrialised countries are fighting to ensure the framework helps them escape their historical responsibility, which they successfully achieved under the Paris Agreement that seemingly has watered down the principle of common but differentiated responsibilities and respective capabilities. Whether Katowice will deliver a balanced rulebook or an eschewed framework favouring the powerful countries due to their manipulative, intimidating and/or carrot-dangling strategies will be judged in the two weeks. Throughout 2018, the Fiji Presidency has facilitated over a series of trust-building conversations meant to agree on contentious issues, including emission reduction levels by countries, support for poor countries and sources of money for such efforts. The Fiji-facilitated interactions, known as Talanoa Dialogue, have been characterised by mistrust and normal rituals witnessed in all negotiations, and sceptics see no credible success in breaking the persistent North-South divide. Though Fiji has tried its level best to apply the spirit of "Talanoa", which means, trust-building, the good intentions of the Pacific Island State have not helped to move the process forward. Indeed, the president will be handing over the baton to his Polish counterpart with his only achievement being process-based " where are we... where do we want to... how do we want to go there" ritual, which avoided to tackle the hard questions threatening to endanger the gains so far made in international climate governance system. For African countries, any framework for the implementation of Paris Agreement that does not define the source of money and technology is hopelessly barren. Rich countries have turned the negotiations into market places to expand markets for their goods and services. In their effort to turn climate change into business opportunities, the industrialised countries and those in transition such as China, India and Brazil have encouraged their major transnational corporations to train their eyes on the emerging opportunities in the "climate sector", where sectors such as "climate-smart agriculture", "forest as Carbon sinks, "clean coal", "climate finance, "low-carbon", "climate resilient growth", are gradually overtaking normal development discourse. There is nothing wrong in turning the challenge of climate change into opportunities as the industrialised countries have vouched in the ensuing transformation where even international development assistance is conditioned. What is curious though is the fact that these conditionalities may disadvantage people already suffering the impacts of climate change. In addition, many donors are only interested in projects that are mitigation in nature, such as energy and major infrastructure projects which assure them on bigger profit margins. Adaptation, which does not have return for investment, is not attractive to many donor partners nor private sector investors. A win-win framework in Katowice which considers the interest of industrialised countries and their businesses, as well as developing countries and their vulnerable communities to enable them transition to low-carbon, climate-resilient development trajectories without jeopardising the livelihoods of the present and future generations is thus the most suitable outcome.